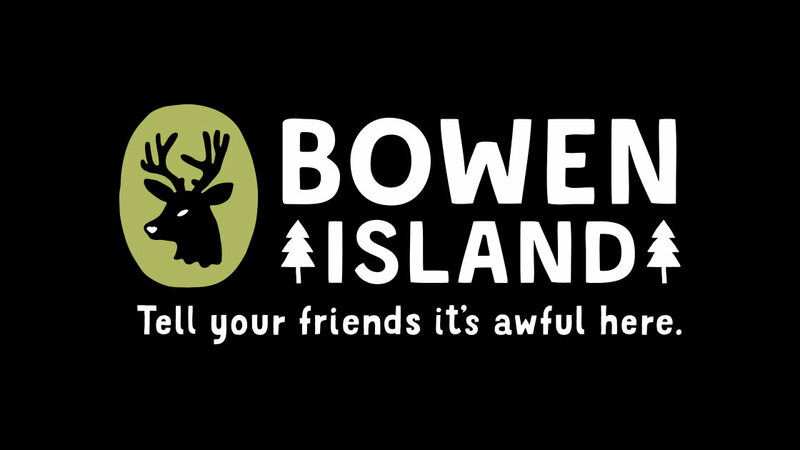 The people of Bowen Island in British Columbia have a love-hate relationships with tourists. To emphasize that, the island has released a startling new community identity: "Tell your friends it's awful here." "We love to show off our island, but we don't want it to be overrun with tourists," explains Chris Staples, a Bowen resident and founder of Vancouver-based agency Rethink. "We want visitors, but only if they really 'get' what makes Bowen special." Inspired by the grassroots "Keep Portland Weird" campaign—whose confidence Staples says Bowen residents admire—the project is the fruit of about two years of work by the Municipal Economic Development Committee, which is run by volunteers. It is based on research, conducted by Storytellings, on hundreds of residents and visitors. Rethink produced the resulting creative, which features quirky granola type and iconography. Four Bowen animals appear in the collateral. The lead mascot is a buck deer. "We all know the deer really own this island and we're just guests," Staples explains. Others include a seal (which represents trying new things, like diving), an eagle (vigilance for protecting nature) and a slug (which represents Island Time, or slowing down to enjoy life). "The last thing anyone wanted was a traditional marketing campaign," says Gordon Ganong, chair of the Economic Development Committee. "Residents and business owners are very proud of this place and more than a little protective. They wanted a community brand that welcomed people, but in a very quirky, slightly defiant way." Check out the videos—which will soon feature the voices of island residents—below.